The old saying ‘you reap what you sow’ means that with every word and action in our lives, we are planting seeds that will grow. Are they seeds of kindness? Seeds of compassion? Seeds of wisdom? If you find that you are striving and you spend a lot of time judging, comparing and scolding yourself, you might ask yourself why you are planting such a thorny and poisonous garden? But if in your meditation practice you have been making wise effort with wise intention, then pause to look around and enjoy the bounty! See if there is something blooming in your life that wasn’t there before. See if there is something growing within you that you hadn’t appreciated before. In class I passed out small pieces of paper and gave the students some time after meditation to write down what they noticed as the fruits of their practice. Afterwards they shared to whatever degree they wanted. One found that she no longer reacted in an ‘eye for an eye’ way when her feelings had been hurt. She could so clearly see now that the hurtful words of a friend came from a place of pain and fear, and nothing was helped by exacerbating it. Another student said she noticed a greater sense of ease, an ability to establish boundaries and a growing self-confidence. Another noted a greater sense of balance. One noticed that her to do list wasn’t so aggravating, that the word ‘should’ was fading from her vocabulary. Everyone noticed something. In fact they all wrote for quite a while. Having just been on a retreat, I noted that I felt lighter, like a butterfly alighting on this flower of life, not plotting to get to the next bigger brighter flower but simply living fully in this moment with great appreciation but not attachment, knowing as a butterfly knows, to just keep doing what I’m doing. I suggested the students fold their little papers up and put them in their wallets for review in moments of doubt. And I suggest to you that you do the same. Who doesn’t at times have moments of doubt? Who couldn’t use a little encouragement, a little reminder in your own words that the practice is working? This becomes particularly valuable when we falter in our practice. It is so easy to let the demands of daily life take precedence. Women can be particularly prone to giving our time away. Yet on closer examination, how rare it is in life that we actually are required to give up the exact time of our practice, or our weekly meditation class. Say, for example, we call to make an appointment for a medical checkup, and the first appointment time mentioned conflicts with our practice or class. Do we just take it instead of asking for another time? For some reason, the way we were raised perhaps, we are susceptible to not claiming what is of value to our own well being. What we forget is that our practice is of benefit not just to ourselves but to everyone around us. Sure, on rare occasions there are emergencies, but even then the daily practice can be postponed instead of cancelled. Notice for yourself if this willingness to give up what is of deep value is a tendency of yours. Daily practice is like the sun, the rain and the rich soil that makes it possible to grow. We can’t really expect much wisdom to arise if we haven’t planted ourselves in our practice, if we just practice on random occasions and hope for the best. If you want to practice but find it difficult to fit into your schedule, I am happy to work with you. You might be surprised how naturally practice can be incorporated into a busy life. Once we have a practice in place, the rest takes care of itself. We are actually saving time because we can put away all the invasive tools we are in the habit of using: harsh views about our self worth, doubts about what we are doing, doubts as to whether anything beneficial will come from this, comparing ourselves to others who seem to be wiser or happier. The blossoms of insight and awareness reveal and release old habits of mind: the words that we torment ourselves with like ‘should’, ‘ought’ and ‘must’, for example. We see them as left over from some past way of seeing. We let them go to whatever degree we are able, gently as if they are dried up leaves that drift away on the breeze. This is the season of the harvest. If you have been regularly practicing meditation, then pause to appreciate the bounty of your practice. 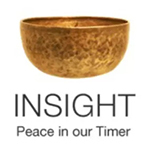 This entry was posted in benefits of meditation, gratitude, insight meditation and tagged benefits of meditation, finding time to meditate, gratitude on November 17, 2017 by Stephanie Noble. I just led a daylong Great Gratitude retreat that seemed to leave everyone in a state of bliss and yes gratitude, according to their end of the day sharing. Going into silence is such a delicious thing to do, although people always think it sounds scary. ‘How can I possibly not talk for hours (and in the case of longer retreats, days) on end?” Easy! One student at the end mentioned how surprised she was at how pleasant it was to be quiet, to not have to think of something to say, and to be together as a sangha in mutual appreciation without needing to communicate orally or even by eye contact. This lovely interior experience is fully supported by the community, and that’s something people forget when they think about going into silence. We did a traditional Vipassana Buddhist style retreat: sitting meditations alternated with outdoor walking meditations. The decks with their boards set the natural walking meditation aisles for formal walking meditation. The gardens were for less formal meandering and communing with nature. 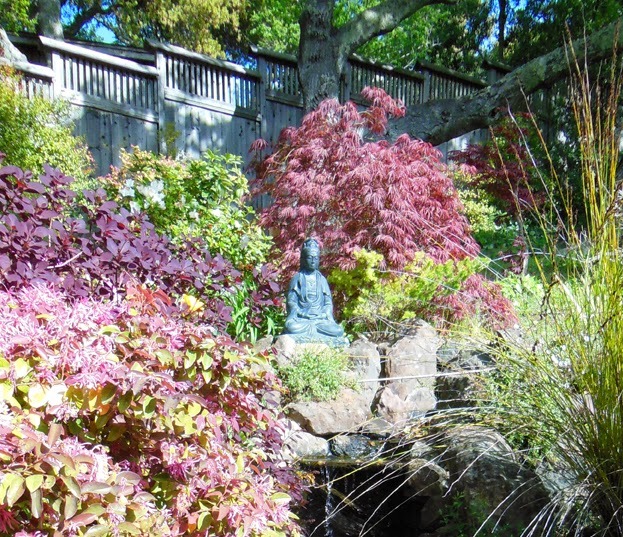 At different points throughout the day meditators would take a seat by the waterfall to do a listening meditation. One meditator kept returning to the base of an old oak. At the end of the day sharing she said it helped her feel her roots. One meditator took note of the great number of species of animals that share the garden with us, sensing community. Another noticed her comparing mind, how enjoying the garden got infiltrated by thoughts of ‘Why isn’t my garden like this?’ One meditator developed gratitude for her feet as she did walking meditation, and recognized what a gift they are, how some people don’t have the use of their feet or their feet are in pain. One meditator felt the flush of creativity that being fully present can provide. You might say well of course it is easy to be present and grateful in a garden on a beautiful spring day, but what about being present amidst life’s difficulties? What about being present with pain and hard choices? 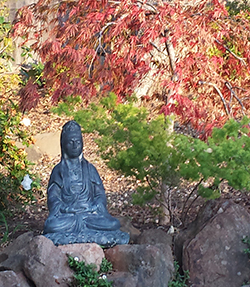 We practice in the garden so that we learn the way to the present moment in any situation. We learn here and apply what we have learned out in the busy world. Since so much of what we struggle with in life has little to do with conditions in the world but much to do with how the mind grasps for, clings to and turns away from whatever arises in our experience, it isn’t necessary to provide unpleasant situations to get the mind to struggle. The mind does this with everything, until we recognize it and find that we can make room for all of life experience if we simply expand our spacious open embrace. Even in a lovely setting we can find something to bother us. As I walked on the cedar decking, I couldn’t help noticing how shabby it was, how mottled, how in need of repair. But after a few periods of seated and walking meditation, I walked the same course and found the same boards to be beautiful pieces of natural art! That’s how the mind is. It finds fault in conditions and situations, and then when it settles down — when the tuning fork of meditation has brought it into balance — it sees beauty everywhere. So if we took this retreat on the road, if we transported it to a slum in Mumbai, at first we might be overwhelmed by the squalor, but after a period of meditation we would begin to see the beauty of the people, the colors, the patterns, the sounds and the energy of life being lived. We would, as people often do, fall in love with something that we had felt such aversion for just a few hours before. Another example: I used to go on a wonderful Buddhist women’s retreat up above the world famous Muir Woods where towering redwood trees fill a deep canyon. During each day of my retreat I would walk down the trail into the canyon and enjoy the quiet of the areas away from the tourist-trodden trails. Towards the end of the retreat, I decided to venture into the populated areas. In that state of mindfulness, my heart filled with such love for the flocks of this colorful species with their bright t-shirts and hats, each little grouping a family or fellow-travelers having its own little world of interaction. What a falling away there was for me of the attitudes, opinions and cynical judgments I carried about my species, especially in crowds. This is the gift of meditation. It doesn’t turn us into zombies. It removes the dust-trapped veils that have prevented us from seeing clearly and experiencing great gratitude for this gift of being present, wherever we are. So we count our blessings. Of course we do. We are not automatons that don’t feel pain at the loss of these kinds of blessings. But when a loss happens, through our meditation practice, we stay present with the experience, noticing what arises. We might notice the heavy pressure in the chest that is so often associated with loss, for example. We stay present enough to hold ourselves with tender compassion. We are willing to feel what we feel and not rush to get past it. We understand that the dark valleys of our lives are where the fertile soil is. Instead of wallowing in the mud, getting stuck in our story of loss, we nurture ourselves, have patience with the process, and grow from our experiences. One thing we learn from loss is that the blessings we can count on our fingers are conditional: our health, our wealth, our homes, our loved ones. These things we are grateful for are finite, changeable and undependable — all the things that make being attached to them a sure fire way to cause dukkha, suffering. 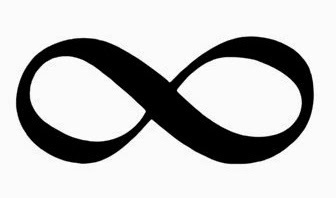 Is there anything that is infinite that we can be grateful for? Yes! We can feel great gratitude for this very moment just as it is, with all its joys and all its sorrows. As long as we are conscious we always have this very moment. Pleasant or unpleasant we have the experience of being present. In moments when our conditional gratitude falters, when we want things to be different from the way they are, or we want things to stay the same and we dread change, can we open to that infinite quality of gratitude for being present simply to experience it all? And in that way can we soften our tight clinging and our fear-based belief that without these things we could not go on? The practice (for the retreat and perhaps for you if you choose to do it) is to notice both the finite gratitude for specific blessings we can name, and then expand into infinite gratitude for this very moment just as it is. There is room for it all if we are present and compassionate. We feel gratitude for being conscious in each moment as it reveals itself. We learn the fine art of holding it lightly and savoring it. This devout gratitude sheds light on the darkest despair, allowing us to discern the treasure buried deep within. It allows us to experience pain as a symphony of passing sensations. Deep unconditional gratitude can be a constant companion that opens our eyes and our hearts. And ultimately, at the moment when we breathe our last precious breath, we are grateful even for this. We can simply let the great gratitude breathe us, illuminating our lives. This entry was posted in gratitude, http://schemas.google.com/blogger/2008/kind#post, loss, moment, retreat, silence on June 8, 2014 by Stephanie Noble.